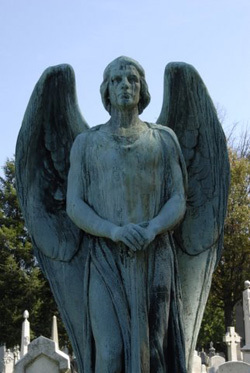 Nowhere else can the visitor view a broader range of 19th and early 20th century Baltimore sculpture than at Green Mount Cemetery. Interspersed among the tombstones, crosses, obelisks, and carvings of angels and mourning women are some significant sculptures cast in bronze. During the second half of the 19th century, foundry skills in this country had developed to such an extent that large-scale bronze statues proved reasonable substitutes for carved marbles. The bronzes, although they may corrode or oxidize with age, have proven more durable than the weathered stones carved mostly by anonymous craftsmen. At Green Mount, visitors have a unique opportunity to trace this city's sculptural traditions from the mid-19th century through the middle of the 20th century. William Henry Rinehart (1825-1874) was Maryland's most prominent sculptor of his generation, and his works are represented in many major museums today. A native of Carroll County, Maryland, he came to Baltimore at the age of twenty-one. Initially he was employed as an apprentice stone-cutter by Baughman and Bevan, a firm located on the site of the Peabody Institute in Mount Vernon Place. At the same time, he enrolled at the Maryland Institute for the Promotion of the Mechanic [sic] Arts (now the Maryland Institute College of Art). Among the tasks first assigned to him was the repair of a marble mantle in the residence of William T. Walters, whose collection would become the core of the Walters Art Museum. Deeply impressed by the young sculptor, the whiskey and railroad financier eventually became one of his principal patrons. Rinehart first traveled abroad in 1855, spending two years in Florence. With William Walters' financial backing, he returned to Italy in 1858, settling in Rome, where he would remain apart from a couple of brief return visits to Baltimore. In doing so, Rinehart was following in the footsteps of older American neoclassical sculptors such as Hiram Powers (1805-1873) and Thomas Crawford (c.18I3-1857). Like these famous predecessors, the Baltimore sculptor established a reputation of being the finest neoclassical sculptor of his generation: he prospered, providing portrait busts as well as figurative works for visiting Americans. 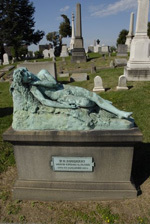 Among Rinehart's major pieces in Green Mount is a bronze statue of a classical Grecian woman strewing flowers entitled Love Reconciled with Death (also known as Girl Strewing Flowers), which was commissioned by William T. Walters in 1865 as a grave-marker for his wife, Ellen Walters. She had succumbed to pneumonia in London in 1862 after catching a chill during a visit in November to the unheated Crystal Palace. Her body was returned to Baltimore the following spring and was buried in Green Mount along with the remains of a son who had died in infancy. For Rinehart, who was a longstanding friend of the Walters family, the commission was "the saddest, but sweetest, duty he ever had to perform." Mounted in the plinth beneath the life-size figure is a bronze bas-relief showing Ellen in profile. It is based on her marble bust which now resides in the Walters Art Museum and was probably commissioned during a family visit to Rome for Easter, 1862. The bronze pieces were cast in Munich in 1866 by the foundry of Ferdinand Von Miller and installed in Baltimore the following year. The plot now contains the remains of William Walters' son Henry (1848-1931) as well as those of two family servants. Henry, the president of both the Atlantic Coast Line and the Louisville and Nashville Railroads, resided for much of his life in New York, yet continued as a generous benefactor to Baltimore, financing the city's public bath system and founding the art museum that bears his family's name. Mounted on Rinehart's own tomb is a bronze cast of his sculpture Endymion. The subject, a shepherd boy holding a flute, was taken from classical mythology. So beautiful was the youth that Selene, the moon goddess, fell passionately in love with him and bore fifty daughters. Subsequently, Zeus, the supreme god, granted the shepherd both eternal youth and eternal sleep. The artist began to model the composition in about 1868, intending to sell it as a carved marble to John Work Garrett, the president of the Baltimore and Ohio Railroad. He had completed it by 1874, and a second marble version was commissioned posthumously for the Corcoran Gallery of Art, Washington, D.C. Seven years after Rinehart's death in 1874, the bronze was cast for his grave in Green Mount. A plaque affixed to base simply states "W.H. Rinehart born in Carroll Co. Md. 1826 Died in Rome Italy 1874." The last is a slight misstatement: the sculptor remained in the city at a time when the summer heat was insufferable and the nearby swamps had not been drained creating a severe health risk. Stricken with the "old Roman fever," Rinehart fled to a spa in Switzerland, where he died, leaving a number of commissions incomplete. William T. Walters and his business partner, Benjamin F. Newcomer, were designated the executors of Rinehart's estate. After he had taken care of relatives, Rinehart assigned the remainder of his estate to Walters and Newcomer's care, stipulating that it be used in "aiding in the promotion of a more highly cultivated taste for art among the people of [his] native state and of assisting young men in the Study of the Art of Sculpture." The funds which under their oversight had grown from $39,000 in 1873 to the princely sum of $95,000 in 1891 were initially given to the Peabody Institute with the intention of establishing a professorship of fine arts and the awarding of scholarships in Rome and Paris. Eventually the monies were transferred to the Maryland Institute School of Art and Design where the Rinehart School of Sculpture was created in 1896. Today, the Rinehart School still offers graduate degrees, and since 1929, the Henry Walters Traveling Scholarship (named for William Walters' son Henry Walters) has been awarded annually by the Municipal Art Society of Baltimore. Among the first graduates of the Rinehart School of Sculpture were Hans Schuler (1874-1951), J[oseph] Maxwell Miller (1877-1933), and Edward Berge (1876-1924), all of whom studied together in Paris where they shared a studio. Upon their return to Baltimore they would dominate sculpture in this city for several generations. 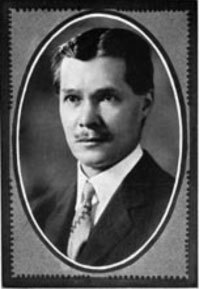 Schuler immediately joined the staff of the Maryland Institute, and, in 1925, was appointed its director. For the last ten years of his life, Miller served as director of the Rinehart School of Sculpture at the Institute, and for three years he also headed the department of sculpture at the Corcoran Gallery of Art in Washington, D.C. Berge led a successful career in Baltimore, as did his two sons, Henry, a sculptor, and Stephens, a painter. Schuler and Miller are well represented in Green Mount; most of Berge's funerary works are to be seen in other Baltimore cemeteries. Schuler was six years old when he arrived in Baltimore with his parents in 1880. They had immigrated from Morange, Lorraine, then part of the German Empire. At the age of fifteen, he enrolled in Maryland Institute, initially specializing in painting, but with the establishment of the Rinehart School of Sculpture in 1896, he decided to become a sculptor. Upon his graduation, Schuler traveled to Paris to enroll in the Académie Julian, a private art school that served as a popular destination for many French and foreign (particularly American) students. Learning of his presence in Paris, the philanthropist, Henry Walters (1848-1931), urged that Schuler be granted a Rinehart scholarship enabling him to remain in Paris. There, he was exposed to various conflicting tendencies in French art, including the officially approved Beaux-Arts style with its emphasis on mythological and allegorical subjects and classical prototypes; Art Nouveau, a decorative style emphasizing the attenuated, linear forms seen particularly in images of women, often with long, flowing hair; and, in addition, the revolutionary approach of Auguste Rodin with its emotionally charged naturalism. One of Schuler’s instructors at Julian was Charles Raoul Verlet (1857-1923), a sculptor of portrait busts and classical subjects who had just been promoted to the rank of officer of the French Legion of Honor. In 1901, Schuler became the first American sculptor to receive the Gold Medal at the Paris Salon. His entry, Ariadne, was drawn from Greek mythology. The disconsolate daughter of King Minos is portrayed on the island of Naxos, where she was abandoned by her husband, Theseus. Two years later, a marble version of the subject was acquired by Henry Walters for his collection. Schuler's earliest work in Green Mount is the Hilken Memorial, which was modeled either in Paris or in Baltimore just after the sculptor's return to this country in 1906. Modeled in a shallow bronze lunette-shaped relief is the bowing woman holding an extinguished torch. Her attenuated figure, flowing gown, and long hair are all traits of the Art Nouveau woman so ubiquitous in France at this time. Throughout his career, Schuler experimented with bronze and stone combinations, the juxtaposition of artifice and nature. In this instance, the contrast of the bronze against the roughly hewn block of granite adds to the interest and aesthetic appeal of this monument. 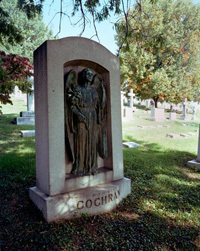 Characteristic example of Schuler's mature style is "Memory," the Riggs Memorial of 1911, which shows a mourning woman draped over a step holding in one hand a wreath and in the other a drooping flower. In much the same vein, from six years later, is the bronze of heavily draped woman posed in a seat cut out of a granite exedra. "Meditation" was commissioned by the Baetjer family. William Sener Rusk, the pioneering art historian of American sculpture wrote of it in 1924 "the cloak was used in a fine sculpturesque manner, but the figure seems somewhat posed and sketchy." 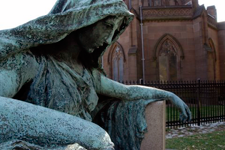 In its idealized beauty and its massive drapery, the Baetjer monument recalls the celebrated memorial to Henry Adams' wife, Marian, in Rock Creek Park Cemetery, Washington, D.C. It is a masterpiece by Augustus Saint-Gaudens (1848-1907), indisputably the most influential American sculptor of his generation. Saint-Gaudens had struggled for five years (1886-91) to create the bronze figure of the heavily clad, mysterious woman seated against a marble architectural setting designed by Stanford White. 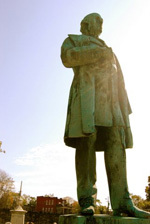 Schuler’s other memorials located in Green Mount include that of John H. O'Donovan (1867-1925), a physician and researcher associated with both the Johns Hopkins Hospital and the University of Maryland. A figure of Christ surmounts his grave. Although it is a rather frail representation of the Savior, it might represent Schuler's nod to the colossal statue of Christ the Consolator, or the Divine Healer, that was placed under the dome of the Johns Hopkins Hospital in 1896. The latter replicates Bertel Thorvaldsen's statue of Jesus (1820) in Copenhagen's Vor Frue Kirke. Although bronze [actually copper alloyed with other metals including tin, zinc, or nickel] when exposed to the weather, inevitably oxidizes or corrodes turning various hues of green and blue. Such deterioration can be delayed with careful maintenance, as is demonstrated by a memorial to another branch of the Baetjer family. In what must be ranked as one of Schuler's finest works, a classical woman is depicted strewing roses from her lap. The accommodation of the full-bodied figure within the tondo, a format associated with the Italian Renaissance, imbues a sense of monumentality and majesty to the relief sculpture. Lorraine Gill Cochran (1918-1929), on the other hand, is remembered by a bronze in high relief set in a stone niche. For the young girl who had died at the age of eleven, Schuler chose to portray an angel holding a lily, the traditional symbol of purity and innocence. The first bronze statue close to the entrance of the Cemetery commemorates the deaths of William August Marburg (1814-1873) and members of his family. Dating from 1939, it represents an idealized female in classical garb. One hand is raised as she bids farewell; in the other she carries a palm frond either symbolizing an early Christian martyr or alluding to Palm Sunday, the day of Christ's triumphal entry into Jerusalem: his followers threw palms before him on that occasion. In this instance, the positioning of the figure on the roughly hewn block of pink marble typifies Schuler's appealing combinations of stone and metal. A decorative plaque on the face of marble is inscribed "The true victory is a life well lived," and the names of the grave's incumbents are listed below. Other Schuler pieces not to be missed include the double memorial to the McCallum-Lockwood families in which an angel holding a bouquet of flowers stands on the McCallum side, and the allegorical figure of Grief is on the Lockwood side; the Schmeisser memorial, in which the ubiquitous classical maiden holds a rose and an inverted torch; and the Maulsby memorial of 1911. 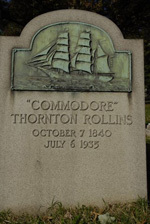 In a different vein is the relief that Schuler designed for "Commodore" Thornton Rollins' marker. He created a shallow relief showing a bark-rigged sailing vessel, the Julia Rollins. Rollins, who began his career working on the Baltimore wharves, became wealthy importing coffee from Brazil and subsequently rose to prominence as a banker. Not only did he serve as commodore of the Baltimore Yacht Club, but he also was a founder of the Lobby Club, a group of Baltimore bon vivants who met regularly to feast on terrapin and champagne. Named after his wife, the ship captured the news headlines in 1894, when she was fired upon in the harbor of Rio de Janeiro during an uprising. J. Maxwell Miller (1877-1933), also a Baltimorean, followed much the same course in his career as did Schuler. A promising student, he won a special "medal of honor" at the Maryland Institute in 1897 and, after graduating from the Rinehart School, he studied in Paris from 1901 to 1905. Like Schuler, he enrolled in the Académie Julian, training under Charles Raoul Verlet. In 1902, Miller received an honorable mention at the Paris Salon. Two years later, he was awarded a silver medal for his entry in the Saint Louis World's Fair. 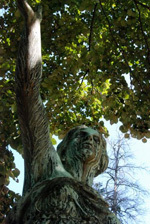 Miller's most famous large-scale sculpture may well be his monument to the Confederate Women of Maryland (1912), which stands on the north-west corner of Charles Street and West University Parkway. Miller's funerary sculptures include a large bronze of the Angel of the Resurrection standing and holding a trumpet. It was this angel who appeared to the two Marys at Jesus' tomb and announced that he had risen. The statue was commissioned by the Tucker family in 1932. Appropriately, it is inscribed: For the trumpet shall sound and the dead will be raised incorruptible and we shall be changed [l Cor. XVLII}. An unidentified critic praised Miller's works noting: "While modern in spirit his production does not bear the hallmarks of the rabid influence of the day, and instead of being rough and brutal with all sorts of things left to be taken for granted or disregarded as is so often seen nowadays - it is almost invariably elegant and refined, depending for its charm chiefly upon its delicacy of modeling and its subjective subtlety." On at least one occasion Schuler and Miller collaborated not on producing bronzes, but in providing models for the four stone reliefs set into the facade of Green Mount's mausoleum. The Mausoleum was erected in 1929 after the designs of the local architects Riggin Buckler and G. Corner Fenhagen. In keeping with the style of the building - a fusion of Art Deco and Neo-classicism, the sculptors modeled their subjects after Athenian classical tomb markers of the 5th to 4th centuries BC. The reliefs depict the departed stoically bidding adieu to grieving loved ones. A factor contributing to the uniformity of the four works is that the actual carving of the stone was most likely undertaken by stone masons employed by the firm of Rullman & Wilson. Large-scale bronze funerary sculpture gradually fell out of fashion: the deaths of so many of the principal practitioners of the art and the scarcity of the metal during World War II were undoubtedly factors. If there are no recent examples in Green Mount, the Cemetery provides visitors other opportunities to see highly personal memorials to the departed. Who, for example can resist the marble statue of the infant Hercules adorned in his lion skin and leaning on his stave. Although the ancient hero was said to have been eighteen years old, not a child, when he strangled the Nemean Lion, the first of his twelve labors, this was a detail that even the artists of Antiquity frequently ignored. 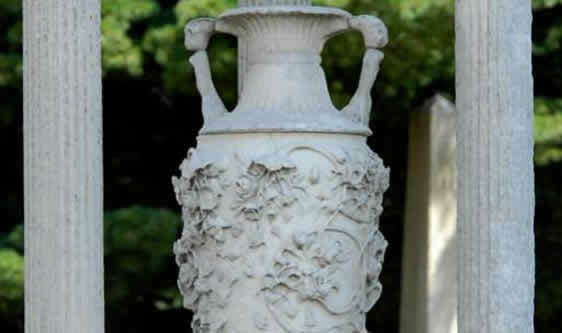 The pictures of the sculptures on this page of the website were contributed by students and faculty of the Maryland Institute College of Art. You can learn more about the institute by visiting http://www.mica.edu/. 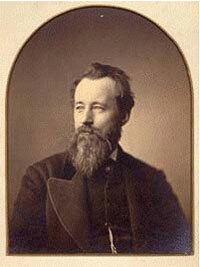 William R. Johnston, Senior Curator at Large and Director of Archives for the Walters Art Museum.